The Streets are set to play seven UK gigs in April 2018 as part of their “The Darker The Shadow The Brighter The Light” tour. The tour has been highly anticipated since The Streets last toured in 2011 and tickets sold out instantly on Friday with hundreds becoming available for way over face value on rip-off secondary sites. Tickets have a face value of £50 but are now being resold for five times the face value on the likes of GetMeIn and Seatwave. Hundreds of genuine fans have missed out on face value tickets and are angry and disappointed about it – and rightly so! 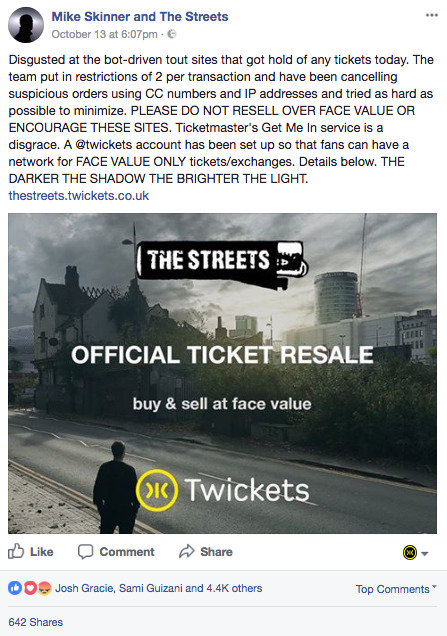 That’s why The Streets have partnered with Twickets so that we can offer fans a chance to buy and sell spare tickets for no more than face value. If there are no tickets available now, set up an alert and we’ll notify you as soon as they become available!